Carrot Cake | Rosetta Bakes! 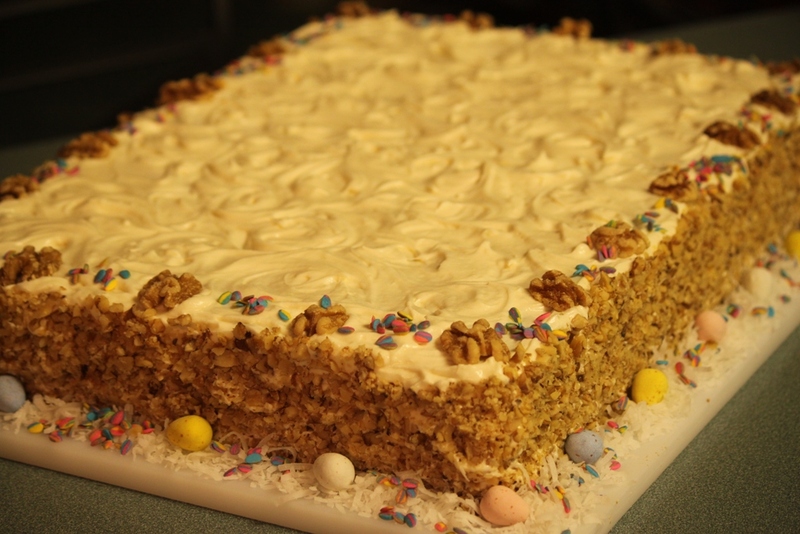 It doesn’t have to be Easter to make a carrot cake, but Easter always reminds me to make one of my most favorite cakes! This carrot cake is so moist because the coconut and pineapple in this recipe gives this cake so much moistness and so much yummyness!! lol I love to see the carrot pieces in a carrot cake,, but you can also puree’ the carrots instead, but trust me, this cake is great either way you do them! The photo below is using a sheet cake pan, but this was for work and I needed a larger cake. Follow directions for a 9 inch round below, or you can make it as a sheet cake instead. Preheat oven to 350. Grease two 9 inch cake pans. Line the bottoms with parchment paper. For the picture above, I used a sheet pan instead. You can use a 13 x 9 inch sheet cake pan if you perfer. Sift dry ingredients into a bowl. Stir dry ingredients together with a whisk to combine well. Add in sugar and mix well with the wire whisk. Slowly add Canola oil, eggs and vanilla. Beat well for about 2 minutes. Fold in the walnuts, coconut, carrots and pineapple. Pour equal amounts of cake batter into each pan. Set in the middle of the oven and bake for about 50-55 minutes, or until the edges have pulled away from the sides and a toothpick inserted in the middle comes out clean. Remove from oven and let sit in pans 10 minutes. Turn out onto a wire rack and remove the parchment paper and let cake cool completely. When the cakes are cool, level with a serrated knife to take humps off. 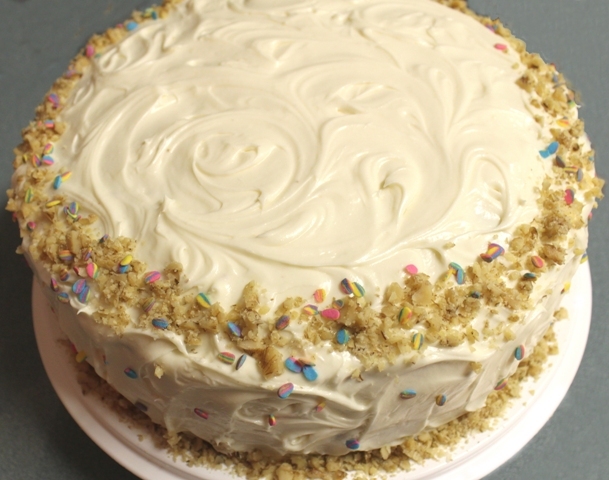 Spread cream cheese frosting between the layers and on top. Some people leave the icing off the sides, it’s your preference. Mix cream cheese and butter well, add vanilla and slowly add powdered sugar…Beat well. Optional to put nuts around edges of cake…but chop them much smaller. This recipe is awesome!!!! Was a big hit during the holidays. arlynlw, so glad you and your family loved this cake. This is the best carrot cake recipe I’ve ever made. Thanks for letting me know you loved this cake! Sorry to be so long in responding, I’ve had to put the blog on the back burner for quite sometime now, but hope to post some new things soon. Have a wonderful day!